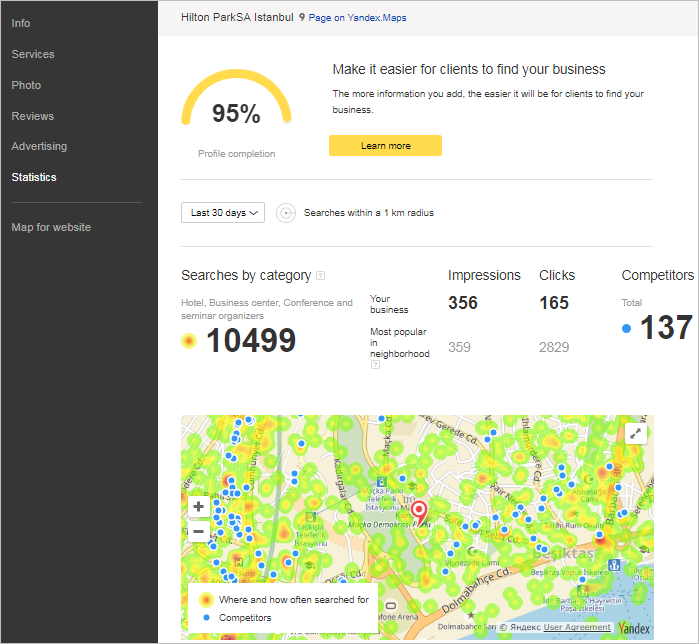 In the Statistics section you can find out how many search queries were made for your category, how many times your business was shown on the maps, and how many users were interested in your company. You can also estimate your competitors and your audience. Choose a period to show the data for: the last 7 days, or the last 30 days. Yandex.Maps search can associate search queries with categories. For example, the search “where to eat” will be associated with the “Cafe” category. One search query can be associated with multiple categories. The system also locates the center of the user's map at the moment of the search query. Knowing your business location, the system counts searches for the specified category within a radius of one kilometer from your business. It displays a heatmap that shows the frequency of searches for your category on the map. A competitor is a business with the same category as your organization. Competitors are also searched for within a one-kilometer radius. If there are more than ten competitors, it shows statistics on clicks and displays for the best competitor. Why fill out the profile? The more information about the organization you enter in the Business Directory interface, the easier it will be for users to find a company's information on Yandex. If a profile is at least 90% filled out, the Information verified by owner icon will appear on the organization's card. You can check your organization profile's completion percentage on the Statistics page. To make a profile more complete, add photos or list additional services that your company provides.